Home Climate Are greenhouses good or bad for the environment? With so much gloom and doom surrounding the subject of global warming and the greenhouse effect, it is only natural that many people are now questioning whether actual greenhouses are a good or bad thing. Do greenhouses enable a greener more eco-friendly lifestyle or are they just an environmental catastrophe on a much smaller scale? The technique of growing under glass is as old as glass itself and is considered to be an essential part of many agricultural and horticultural undertakings not to mention gardeners. The benefits for it are quite straightforward as the greenhouse provides a controlled environment which can result in optimal growth meaning that plants can be successfully reared with little regard to the weather conditions. This extends the growing seasons for many crops and this can have financial advantages as early or late crops can command a premium price. The same goes for flowers which traditionally are most expensive around Valentine’s day which is hardly in the middle of the flower growing season. Gardeners are able to start their seeds much earlier in the year than if they were sown outdoors and some crops can really only be grown under glass in the UK. With so many advantages it may seem inconceivable that a greenhouse could possibly have any environmental downsides but there are some which need consideration in order to minimise any adverse effects. It is easiest to look at different types of greenhouse in order to assess the pros and cons of each. and glass production is relatively straightforward requiring some energy use but it is a fully recyclable product. 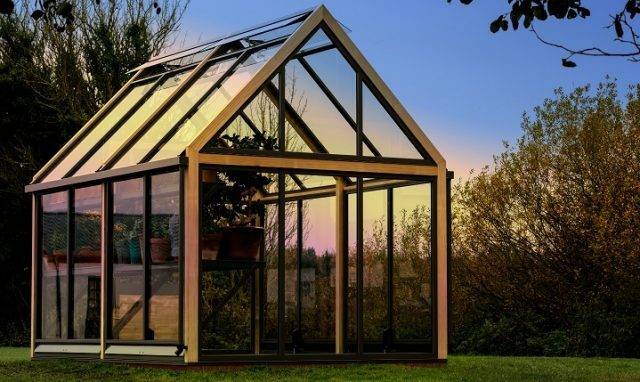 The greenhouse frame, on the other hand, can be made from ethically sourced timber but by far the most common material is aluminium, the manufacture of which requires a huge amount of energy. Fortunately, much of the World’s aluminium production utilises electricity from hydro-electric plants rather than fossil fuels. So the aluminium greenhouse structure will have some environmental impact but all materials are long lasting and fully recyclable. The next consideration is the method of use. Greenhouses are usually classified as being cold, warm or hot houses and have different energy requirements. The simplest is the cold house which employs no form of heating other than from the rays of the sun. The warm house is heated early and possibly late in the growing season and the hot house has year round heating. Various types of heating are employed including paraffin and electric heaters both of which can directly or indirectly contribute to carbon dioxide emissions. It is an interesting fact that plants grown in a carbon dioxide rich environment show increased growth and despite its reputation as the villain of the peace, carbon dioxide is an essential plant nutrient. The next step up in size is the ubiquitous Poly-Tunnel which offers many of the advantages of a traditional greenhouse but in a very simple cost-effective package. A polythene cover is simply placed over a row of steel hoops. Poly-Tunnels are widely used for extending the growing seasons of food crops and are rarely heated. They have negligible environmental impact and the materials used are fully recyclable. These are the large greenhouses where many young plants are raised and food crops grown. The growing conditions are much more controllable than with Poly-Tunnels and heating and ventilation are carefully monitored. The use of heating and forced ventilation do add to the environmental impact of these large sites but, from a financial viewpoint, this is offset by their ability to produce reliable high-value crops. These are the giants of the greenhouse world and they provide all year round ideal growing conditions enabling crops to be produced with factory precision and reliability. Crops often regarded by gardeners as annuals like tomatoes can be grown as perennials with constant fruiting mimicking conditions in the tropics. The temperature and internal atmosphere are usually computer monitored and artificial lighting used to enhance growth. The carbon requirements of the plants are often supplemented by the introduction of carbon dioxide gas. This can really only be described as “Factory Farming”. Such installations involve substantial initial investment and environmental impact but are an extremely cost effective way of producing food on a large scale. Due to the large heating requirements of these installations, they are often built adjacent to power generation plants utilising waste heat. So from the humble greenhouse at the bottom of the garden to the industrial giants, all greenhouses can help to produce more top quality produce than could ever be achieved outdoors and they represent a very efficient use of land. The benefits of a greenhouse to the environment vary from having zero impact to being energy hungry producers of carbon dioxide. However, even the largest installations have little environmental impact compared with most of industry as greenhouses often use recycled waste heat and employ sophisticated atmospheric controls with low energy lighting and high levels of insulation. The main cause for concern would be in the use of manufactured carbon dioxide gas by some growers as this is almost always derived from the petrochemical industry. In these times of increasing levels of greenhouse gasses, there would seem to be some scope for employing systems of atmospheric carbon capture in the production of these products which would then render the process carbon neutral. Greenhouses are simply superb at maximising the potential of free solar energy to our advantage. Cooling is usually a simple matter of simply opening doors and windows with the possible use of shading during the hottest periods. Products can be grown that would otherwise have to be imported and these environmental savings can be offset against the energy costs of large establishments. So are greenhouses truly green? … You bet they are! Is there a way of telling how ‘green’ the aluminium is that is used for greenhouse frames? Is there an energy certification or anything like that I can use to tell me if the energy used for manufacture is renewable? I wonder about the impact on wildlife when acres of ground is covered by glass buildings. People often shun meat, and often for a good reason, especially red meats are bad…. but I could eat 1kg of pork and impact the environment less, than eating a cucumber grown in a greenhouse, this has been proven by countless of tests…. it would be far better for the environment, even if I had it transported from a thousand km away, than eating it from a greenhouse…. Really only the cold greenhouses you have at home, which only use glass to amplify the sun, especially in an environment such as earth houses where the heat can also heat the house, can be accepted from an environmental point of view…..
Best guide (food related) to helping the environment is eat less meat, never eat red meat(sustainable farmed seafood and poultry is best, insects are also good, but harder to convince people to eat)…. eat seasonal food, as local as possible, but never greenhouse grown food from the markets at least, homegrown can be ok…..
thats what i was kind of thinking. so like a small at home greenhouse or hoophouse would really be the only one that don’t contribute to harming the environment right?